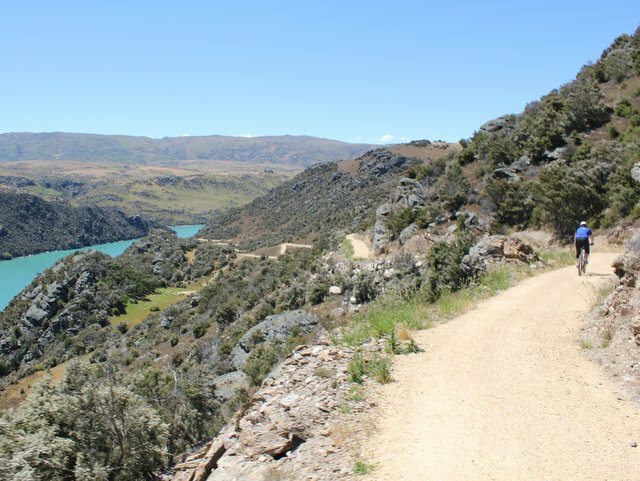 Discover another world cycling on the remote and stunning Roxburgh Gorge Trail. With 21km of cycling and a 13km boat ride in the centre to join up the two sections, this trail is all about the experience and you can choose whether you want to do all or part of it. With most cyclists starting from Clyde, the jourey stretches out to approximately 33 km making it a good days cycling. 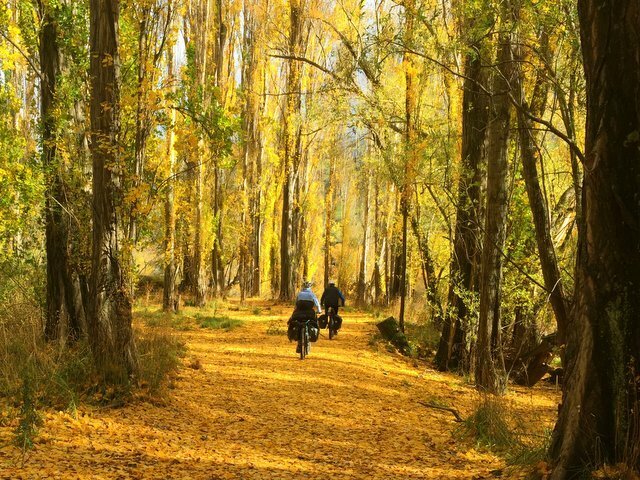 The Roxburgh Gorge trail is often combined with the Clutha Gold Trail to provide a multi day cycling experience spanning two to three days. 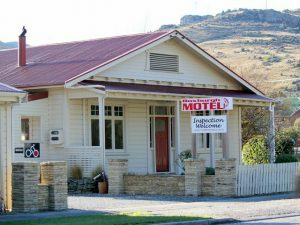 For cyclists looking to experience Central Otago’s “Best”, combine with the Otago Central Rail Trail. Note that the centre 13 km section of the trail must be passed by boat as the trail is not yet complete. Most cyclists start from Clyde when riding the trail which means you’d cycle 34 km. 1/2 day to one full day depending on fitness. The first half of the trail from Alexandra to Doctors Point is relatively easy riding. The second second from Shingle Creek has a solid climb and then descent. It’s this part that can take some cyclists a bit longer than they expected. The trail can be ridden in both directions from Clyde/Alexandra to Roxburgh Hydro or Roxburgh Hydro to Alexandra. 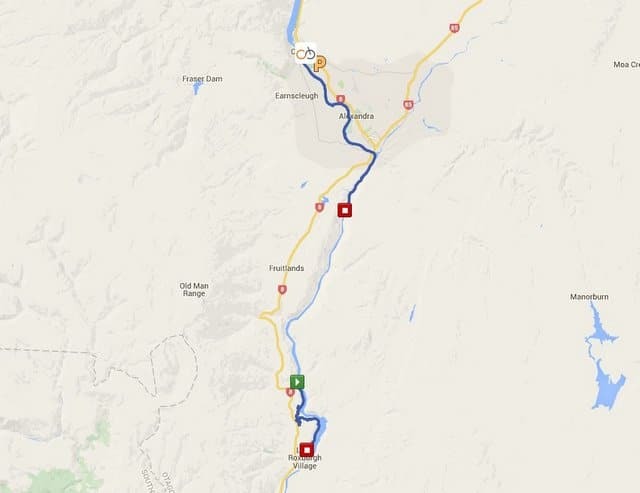 Most people ride from Clyde / Alexandra in the direction that the Clutha River is flowing. Rated as “Grade 2 Easy to Grade 3 Intermediate” by New Zealand Cycle Trails. The 10km Alexandra to Doctors Point is relatively easy riding with the main climbs and descents on the 13km Shingle Creek to Roxburgh Dam section. We recommend an average level of fitness for this trail, the second half isn’t particularly long but its gradient does catch some people out that are not used to riding up a hill. Skill is needed to negotiate the various switch backs in some sections so you need to be comfortable with braking and gear changing. Purpose built cycling trail with very hard packed gravel. It’s an excellent surface and very fast riding. Most people choose to ride in Spring / Summer / Autumn. The high season runs from after Christmas to the end of April. Winter riding is certainly possible as the weather is generally very settled. Some facilities close over winter so pre-planning is critical and you will generally need to be carrying your gear on your bike as bag transport is may not be available. A range of general stores, 4 Square supermarkets, cafes, hotels and restaurants are located at either end of the trail. You need to carry food with you onto the trail as there are no refreshments stops on the trail itself. We provide you with a full food and snacks guide that details the various options for you. Like the Otago Central Rail Trail, the Roxburgh Gorge and Clutha Gold trails share that unique advantage of having international airports at either end. So, if it works for you with flights, you can fly into Queenstown and out of Dunedin (or vice versa). It’s also easy enough to be returned to Queenstown when you’ve finished. 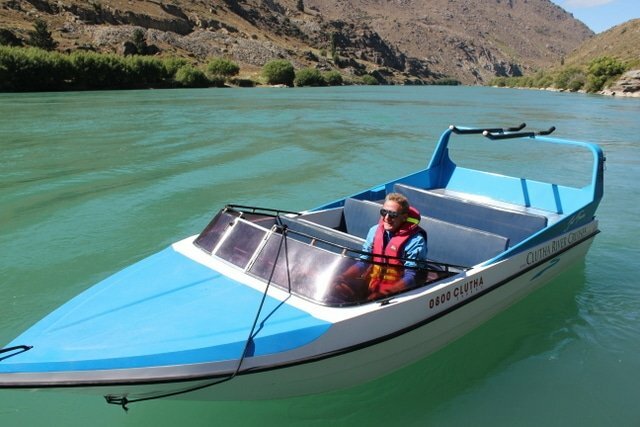 As the Roxburgh Gorge trail on its own) is a day trip, the cost for the day is your bike hire, trail maintenance contribution and boat ride across the center section. The total price will vary based on numbers and group composition as some concession rates are available for children and large groups on the boats. The family trail maintenance contribution is very economical, particularly if you’re continuing on to ride the Clutha Gold Trail. Shebikeshebikes offer a fully customised, free itinerary service so you can get the most out your Roxburgh Gorge trail adventure. You’ll find a range of starting options provided below to give you an idea about what might suit you and what an indicative cost might be. We’ll work with you to refine things and book the accommodation and transport to suit your requirements. The itinerary you’ll received is fully itemised so you’ll know exactly what you’re paying for. 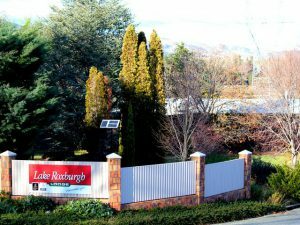 You’ll need to be fit for this one with 106 km of cycling over two days down the Roxburgh Gorge and Clutha Gold Trails before finishing in Lawrence. 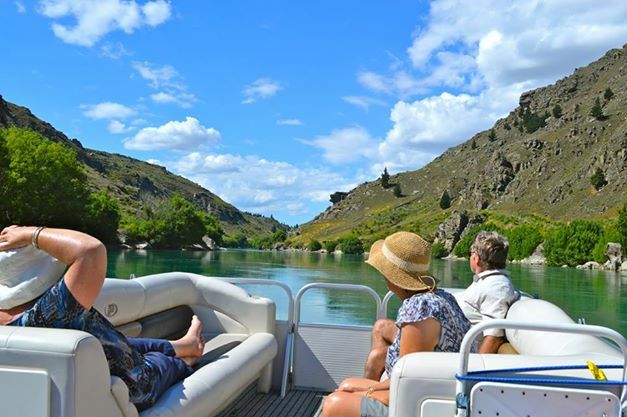 With a little more time up your sleeve you can afford to cruise on this three day adventure that takes you across the Roxburgh Gorge and Clutha Gold trails. 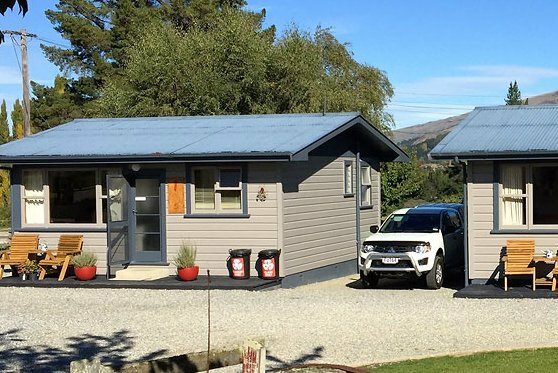 The Roxburgh Gorge trail has a variety of accommodation at either end to meet most requirements. Accommodation is broken roughly into budget, mid range and luxury options. Budget options are available in Clyde, Alexandra and Roxburgh, Millers Flat and Beaumont. Budget accommodation does not include breakfast and own bedding may be required or hired at an additional cost, bathroom facilities are shared and cooking facilities are available. Rates are based on twin share in most cases. Mid Range accommodation includes a mix of self contained accommodation, motels and B&B type accommodation and holiday houses. A continental breakfast is included in some cases. Bathrooms range from shared to en-suited depending on the property. Rates are based on twin share in all cases. 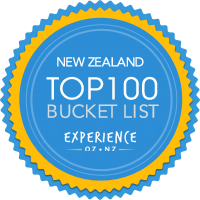 Experience the best that Central Otago has to offer. Although luxury accommodation is not available in every town we can help structure your itinerary to make it work for you and help you with any transport options. Luxury accommodation provides en-suited accommodation, continental breakfast in all cases and full breakfast in some. All pricing is provided on a room basis for double or twin occupancy. On and around the Roxburgh Gorge Trail you’ll find some great activities to add that little bit extra. A wine tour provides an excellent way to transition between Queenstown and Clyde. 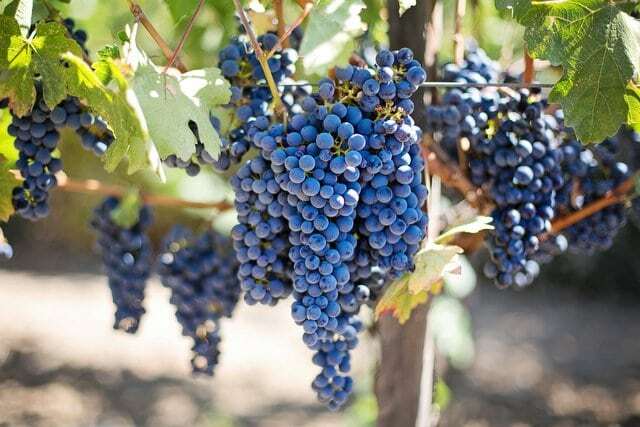 Central Otago is renowned for its Pinot Noir and you’ll find many other great varieties to taste. Take a cruise down the mighty Clutha / Mata-au and explore the gold mining heritage from yesteryear. Like the cruise but with the excitement of a jet boat! This tour takes you from Clyde through to the historic Doctors Point gold mine to explore the gold mining history.